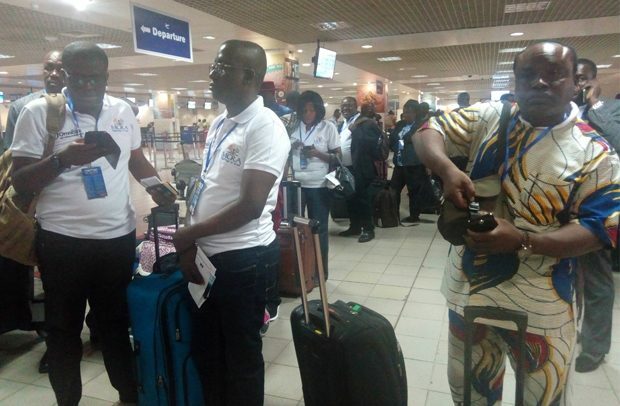 A TOTAL of 55 Christian Pilgrims left the shores of Ghana for Israel on Sunday, September 9, 2018. They are part of the 205 people billed to perform the pilgrimage to Israel this year. They are expected to embark on a week-long pilgrimage whilst in the Holy land of Israel, and return to Ghana on Sunday, September 23. An additional 150 pilgrims are due to leave Ghana on Friday, 14th September, for Israel as part of the second edition of the pilgrimage under the Akufo-Addo government. Deputy Minister of Chieftaincy and Religious Affairs, Paul Essien, led the batch of 55, who left at about 12 noon on Sunday. The Chieftaincy Minister, Kofi Dzamesi, who is to lead the second batch on the 14th, visited the pilgrims at the Aviation Social Centre to bid them farewell before they set off. Mr. Essien told DAILY GUIDE that the 205 pilgrims made up of men, women and children were from across the 10 regions of Ghana. He said they were made up of traditional and Christian leaders, and members of a number of churches who want to experience in reality what they have been taught in their respective churches about Christianity, the birth place of Jesus, among others. He expressed the believe that in as much as Muslims go to Mecca all the time to renew their faith, Christians should also be encouraged to visit Israel to renew their faith and to see for themselves things that they preach about from the Bible. Some of the pilgrims, who spoke to DAILY GUIDE, expressed their excitement about the holy journey. For some of them, it is the first of its kind and they were full of smiles as they went through their boarding formalities at the Kotoka International Airport (KIA) to embark on the Holy Journey onboard Ethiopian Airlines. Rev. Canon Charles Lawrence Kwabena Amankwa of the Anglican Church at Abetifi Kwahu in the Eastern Region, a first timer, told this paper that he had been reading the Bible about Jerusalem, Israel and Jesus Christ, an exercise he described as purely theoretical. He said, therefore, it was time for him to have an experiential and practical aspect of Christianity, and the pilgrimage for him is simply apt to aid in that regard.